H D Consultants to be the winner of the coveted ‘Buy To Let Mortgage Firm of the Year, 2013’ award at a Gala Dinner and Awards ceremony attended by hundreds of finance professionals, advisers, lenders and industry providers. 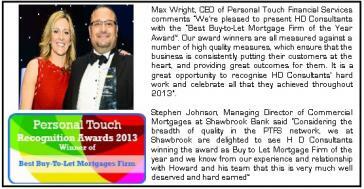 Max Wright, CEO of Personal Touch Financial Services comments “We're pleased to present HD Consultants with the “Best Buy-to-Let Mortgage Firm of the Year Award”. Our award winners are all measured against a number of high quality measures, which ensure that the business is consistently putting their customers at the heart, and providing great outcomes for them. It is a great opportunity to recognise HD Consultants' hard work and celebrate all that they achieved throughout 2013". In what is also H D Consultants’ 21st birthday year, receipt of this award is indeed a testament to the Company's longevity, quality of advice, professionalism, team excellence and Client satisfaction. Howard Reuben, Founder and Principal of H D Consultants, collected the award on behalf of the Firm and afterwards said “Through a rollercoaster of years when the industry, economic climate and also my own career and business has seen some tumultuous times, we have stuck to our principles of focusing on providing excellent Client service, and my current team of Advisers and staff have shown great loyalty, persistency, business acumen and professionalism throughout. " "What makes this award even more special is that it is voted for by our colleagues at the network without any votes being requested, prompted or touted for. The presentation of the award was a genuine surprise. To have seen our name up in lights as one of the three finalists was a shock in itself, but to be named as the winner was a moment of elation and immense pride. We feel honoured to have been singled out amongst our esteemed peer group and feel very proud to be branded as 'Buy To Let Mortgage Firm of the Year' ." H D Consultants also actively works in the short term lending and bridging finance market and has recently advised Clients on a £1m bridging loan arrangement for a complex case. Their Client has commented; “My wife and I were incredibly fortunate to discover HD Consultants. We had a complex application involving a very short lease, an estate planning transfer, a sizeable loan and numerous ensuing lender requests, all of which Howard Reuben attended to with great thoroughness that enabled a successful and speedy completion. We are profoundly grateful to Howard for his enduring patience, professionalism and persistence and could not recommend him more highly.” Maxim Parr, CEO, Quercus Associates. H D Consultants has indeed seen growth over recent years and yet another Adviser has recently joined their expanding ranks. Now with a local presence in London, this is testament too to the fact that other quality finance professionals seek out the Firm and want to work under the respected Company’s brand. Other candidates are being interviewed as well and Howard says that the increasing volume of new business needs to be serviced, and when the right Adviser passes the stringent application checks, so new professional Advisers will also be added to the team. And talking of new business growth, H D Consultants is now also very close to announcing the addition of three new professional Introducer Firms who have sought out this award-winning Company to provide the full range of financial services to their Clients. Add these three new Introducers to H D Consultants’ existing prolific business partners, which already includes a network of c200,000 property investors and a long established Directly Authorised insurance Firm who outsources their mortgage, life cover and commercial finance enquiries to them, and there is no doubt that this Company is still going places. 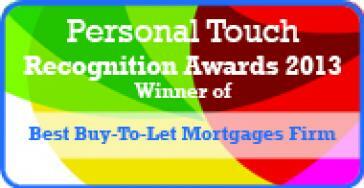 So what does 2014 hold for the ‘Buy To Let Mortgage Firm of the Year’ award winners? If the above is anything to go by, H D Consultants will simply keep on working closely with their current and future Clients and select panel of approved business partners, providing professional and quality services throughout the UK.